Today marks the 7th month since I started this life changing journey on August 20th. 😀 I knew that would happen… LOL… 2 steps forward 1/2 a step back… Hakuna Matata, I had a pretty good day. Worked 1/2 a day to make up for working all day on Sunday. 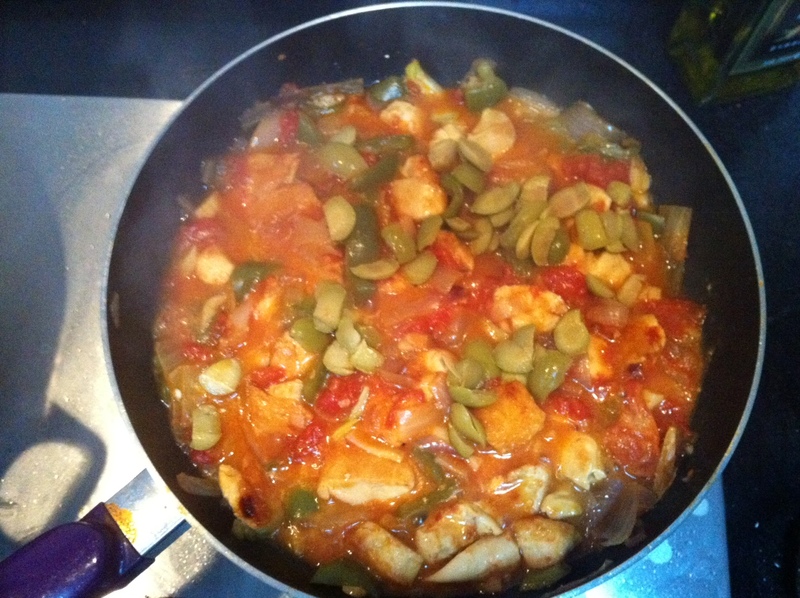 This recipe comes from my favorite Dukan recipe blog Hapa Couple. I changed it up a little bit to make it Dukan Cruise friendly and because some of the items on their list are not necessarily available here in China. Additionally, I don’t have an oven, so mine was cooked on the gas burner. Also, their recipe is for 4 Servings. 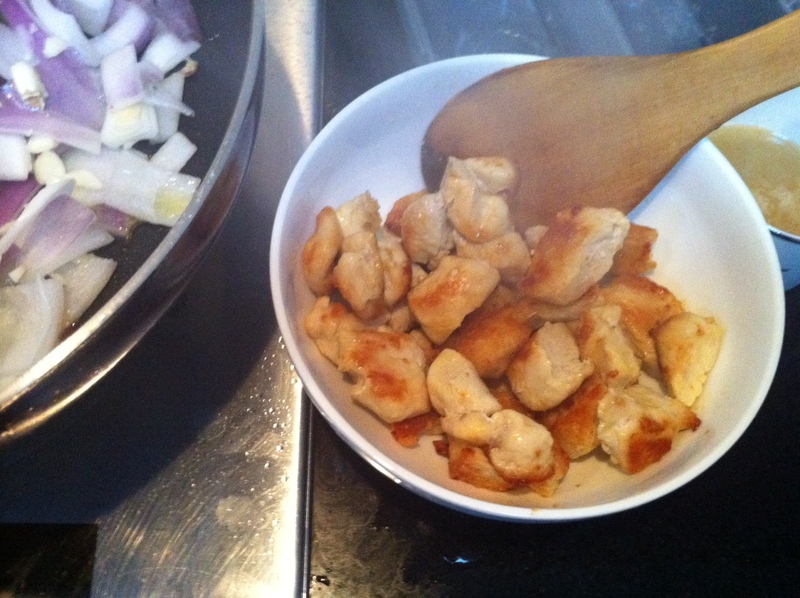 Place 1/2 Tbs Olive oil in pan on med/high heat and add chicken. Brown on both sides, remove to a bowl. 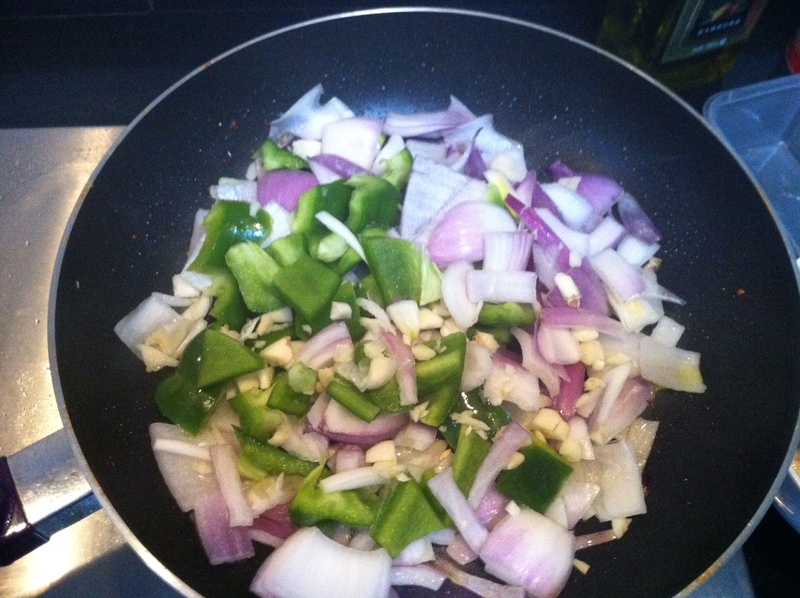 Place 1/2 Tbs Olive oil in pan on medium heat and add onion, garlic and pepper, cook for 3 minutes. 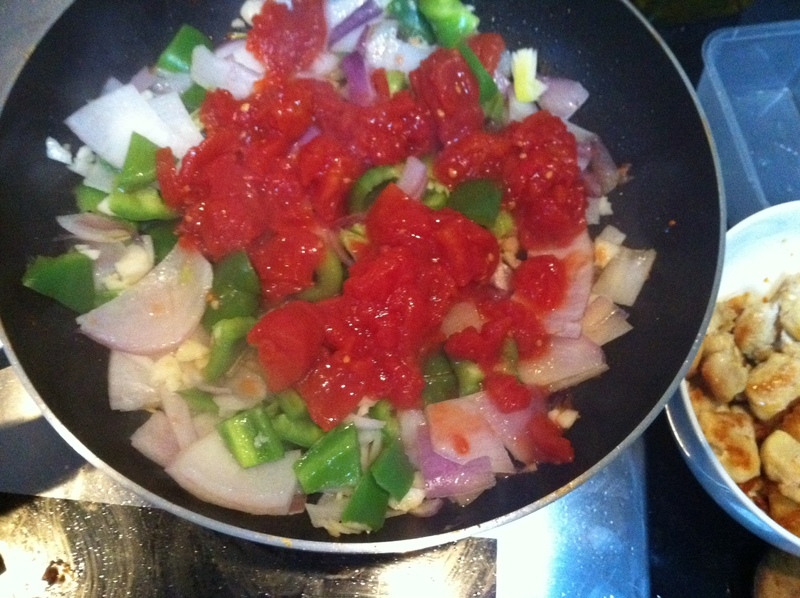 Add tomatoes to the pan and cook for 2 minutes. Pour in chicken broth, stir and cover for 2 minutes. 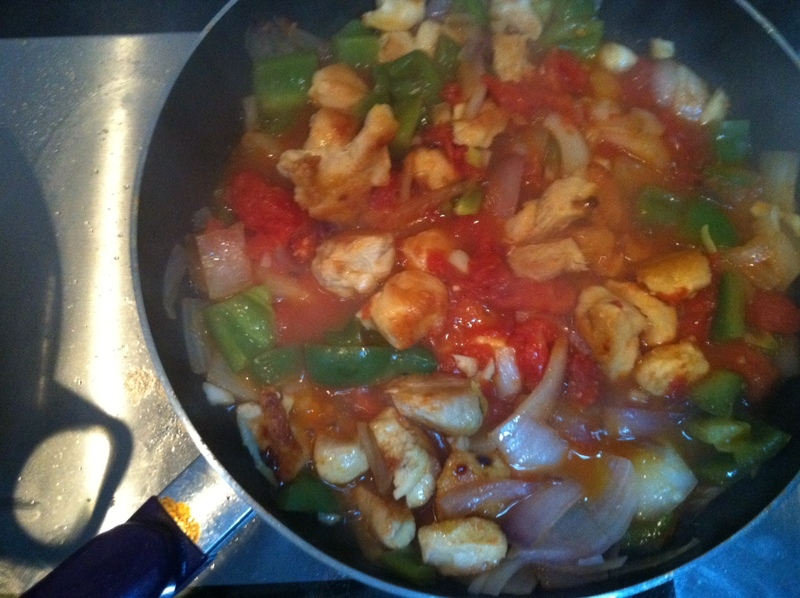 Add cooked chicken into mix and reduce temperature to low. Simmer 7 minutes. Pour in the cornstarch mix stir, Add Olives, stir. Simmer 2 minutes. You could put this over zucchini pasta it’s zucchini cut to resemble pasta and parboiled… OR you could put this over shiritaki noodles. And the final stat that I promised at the top. I haven’t mentioned on my blog my starting weight OR my current weight at any point. Few people knew (up til now) how much I weighed when I started on Dukan. I still have 11 pounds to reach Dukan’s True Weight of 165 lbs and 21 pounds to MY goal of 155. I can’t say it enough times… the support I get from all of you; my family, friends and new blogger friends has been the key to my success. I am humbled by your kind words and cheering! This entry was posted in Birth, China, Dukan Diet, Life, Running, Travel, Weight Loss and tagged diet success, dukan chicken recipe, Dukan diet, dukan recipe, dukan success, easy chicken recipe, inspiration, low carb chicken recipe, low carb recipe, perseverance, postaday, PV day, skinless chicken breasts, tea eggs, weight loss, weight loss success by flamidwyfe. Bookmark the permalink. Wowza! Thatgood for you, Sandi 🙂 That is just outstanding and you are such an inspiration to many and to me as well … Cheers! Great food pictures. And that chicken made my stomach growl (I’m working till 9 pm tonight…) Congrats on all you’ve achieved – so happy for you! Thanks! I like showing that you can lose weight and eat great! Just one thing to say….AMAZING! Thanks, Caroline 🙂 xoxo You look amazing, too! Wow! You are the incredible shrinking woman- amazing stats! Have you gone and picked up what you have lost? I did and could barely pick up! I am getting closer to goal – 14 lbs and am looking forward but apprehensive about the next stage consolidation that I will be on for about 250 days! . I will read the book – again 🙂 and follow to the letter and keep the weight off for the first time once and for all! Sun out again 🙂 Keep up with recipes, my hubby keeps asking me what book I’m getting these recipes out of! We’re on the stretch to consolidation. My opinion the most challenging phase. Keeping it OFF!!! How awesome are you?!?!? Amazing stats / amazing measurements! Sandi you are FAB! Ignore that little gain on the scale, I think this is just the way it goes the closer you get to the finishing line. That chicken looks delicious. I will make it tommorrow, cant wait……. Thanks, Sonia!!! I’m back down this morning, so all’s good… no time to blog until after work…. traded blogging in for an extra hour of sleep 🙂 And I feel great!